Having your spices organized makes prepping and cooking food easier since you can find what you need when you need it. This saves you time in the kitchen, and also prevents purchasing the same items which saves you money. Below you'll find step-by-step instructions on how to organize your spices as well as recommended spice organizer products. 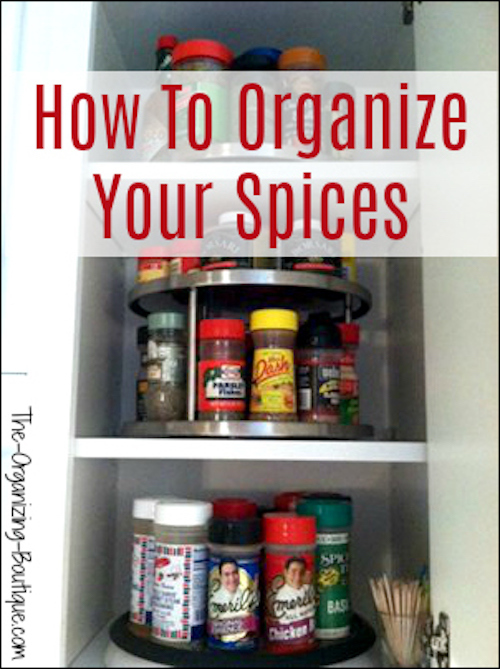 Utilize the general organizing procedure of purge, sort and store, and apply it to organize spices. Start by gathering all of your spices. Pick up ONE bottle at a time, and decide if it is worth keeping. In order to accomplish this, ask yourself appropriate questions (Does it still have its potency?). As you make decisions, put the item in the corresponding pile, bag or box - Keep or Trash (trash the contents and recycle the bottles). You have pared down, and now you can focus on what's left. Sort the remaining items into categories that make sense to you and to your storage space (i.e. sweet spices, savory spices, herb spices, most-used spices, tallest spices, shortest spices, etc.). If you have multiples of the same spice and they are all still good, then consider combining them into one bottle. This will save some space. Put your categories of spices away in a kitchen cabinet, in a kitchen drawer or in the pantry depending on what makes sense to you for easy access and fits within your storage parameters. If you use a kitchen cabinet or pantry shelves to store your spices, put the most used spices on the shelf that is easiest to reach and the ones that are not utilized that often on the shelf that's harder to access. This is my spice cabinet! I use turntables to organize spices and they work so well. I can find what I need in seconds. If you use a kitchen drawer to organize spices, then put the frequently used ones in the front and the scarcely utilized items in the back. You may want to consider employing a spice drawer organizer to keep everything in order and or spice labels for easy recognition. You can also consider putting the spices you use daily out on the kitchen counter near the stove or in magnetic tins attached to the fridge. This makes it really easy to access them and saves some space in your drawer or on your shelf. A few times a year, go through your spices and pitch the ones that have lost their potency (lose their smell or color). Generally, spices will last for a few years without losing their pow. Here's information on how long to keep spices. A good habit to get into is to write the purchase date on the spice bottle with a Sharpie. This small task can really speed up the purge process. This is one of the turntables I use in my spice cabinet and all over my house! I love it and recommend it to everyone. Also in my photo above is this lazy susan spice rack. It's the one on the bottom shelf for the taller spices. It is made well and works great! 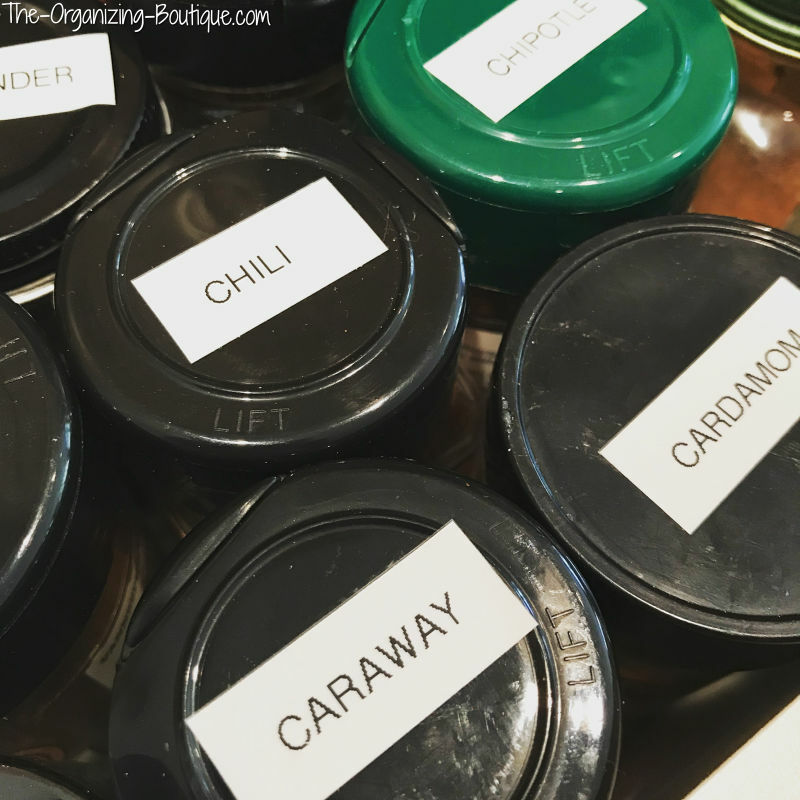 If you use a drawer to store your spices, this organizing product will keep it nice and neat! Save shelf and drawer space with these magnetic containers. They have clear lids for easy recognition! Looking for spice labels? There are tons out there, so here are the top-rated ones on Amazon. Take a peek! Magnetic spice racks are great, because they save counter space, drawer space and cabinet space. Awesome! Looking for a wooden spice rack? Check out these top-rated products on Amazon. 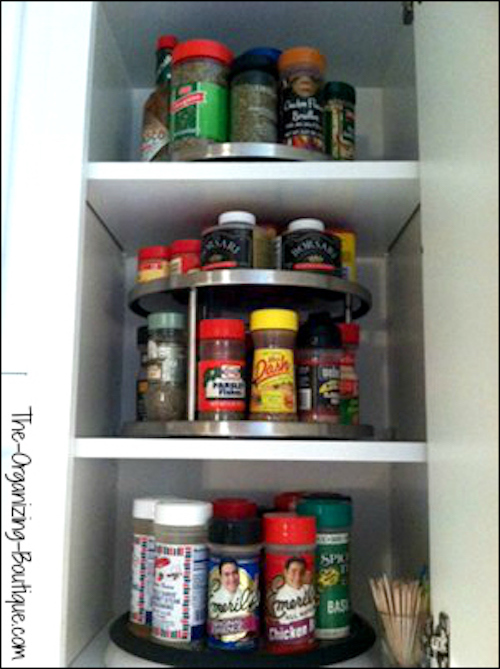 Want to conceal your spices inside a cabinet without taking up shelf space? Take a look at these cabinet door spice organizers!